The Marriott World Trade Center (bottom) below the Twin Towers. The hotel was connected to the North and South towers, and many went through the hotel to get to them. The hotel had a few establishments including The American Harvest Restaurant, The Greenhouse Café, Tall Ships Bar & Grill, a store called Times Square Gifts, The Russia House Restaurant, and a Grayline New York Tour Bus ticket counter. It also housed a gym that was the largest of any hotel in New York at the time, and a hair salon named Olga's. The hotel also had 26,000 square feet (2,400 m2) of meeting space on the entire 3rd floor, along with the New Amsterdam Ballroom on the main floor. It was considered a four-diamond hotel by AAA. In 2002, Host Marriott Corporation was offered an opportunity to rebuild the hotel in the same location within the World Trade Center site as its lease had not expired. Marriott rejected the offer, thus giving the land to the National September 11 Memorial & Museum. On Friday, February 26, 1993, the hotel was seriously damaged as a result of the World Trade Center bombing. Terrorists affiliated with al-Qaeda took a Ryder truck loaded with 1,500 pounds (682 kilograms) of explosives and parked it in the North Tower parking garage below the hotel's ballroom. At 12:18 PM (EDT), the explosion destroyed or seriously damaged the lower and sub levels of the World Trade Center complex. After extensive repairs, the hotel reopened in November 1994. 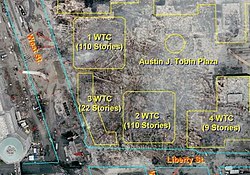 Aerial photograph of the World Trade Center site with markup showing original locations. The hotel was located at 3 World Trade Center. On Tuesday, September 11, 2001, the hotel was at full capacity, and had over 1,000 registered guests. In addition, the National Association for Business Economics (NABE) was holding its yearly conference at the hotel. When American Airlines Flight 11 crashed into the North Tower (1 WTC) at 8:46 AM EDT, its landing gear fell on the hotel's roof. Firefighters used the lobby as a staging area, and were also in the hotel to evacuate guests that may have still been inside. Firefighters also reported human remains of entire corpses on the roof from people that had jumped or accidentally fallen from the burning towers. The collapse of the South Tower (2 WTC) at 9:59 AM EDT split the building in half (such damage can briefly be seen in the documentary film 9/11), and the collapse of the North Tower at 10:28 AM EDT destroyed the rest of the hotel aside from a small section (as seen on the picture) that was furthest from the North Tower. Fourteen people who had been trying to evacuate the partially destroyed hotel after the first collapse managed to survive the second collapse in this small section. The section of the hotel that had managed to survive the collapse of the Twin Towers had been upgraded after the 1993 bombing. As a result of the collapse of the Twin Towers, the hotel was destroyed beyond repair. Only the southern part of three stories of the building were still standing, all of which were eventually removed. In the remnants of the lobby, picture frames with the pictures inside them were still hanging on the walls. Approximately 40 people died in the hotel, including two hotel employees and many firefighters who were using the hotel as a staging ground. In January 2002, the remnants of the hotel were completely dismantled. The National September 11 Memorial & Museum now exists where the hotel once stood. The building and its survivors were featured in the television special documentary film Hotel Ground Zero, which premiered September 11, 2009 on the History Channel. ^ "Realty News World Trade Center Getting New Tenants". The New York Times. April 1, 1979. Retrieved May 26, 2018. ^ "The city's newest hotel, the Vista International, officially opened..." UPI. July 1, 1981. Retrieved May 23, 2018. ^ Federal Emergency Management Agency, (FEMA) (2002). World Trade Center Building Performance Study: Data Collection, Preliminary Observations, and Recommendations. Government Printing Office. p. 3-1. Retrieved September 25, 2018. ^ Eisner, Harvey (April 2002). "Terrorist Attack At New York World Trade Center". Firehouse Magazine. Archived from the original on 2009-09-27. ^ "New York Marriott World Trade Center (archived website)". Archived from the original on 2001-03-02. Retrieved 2001-03-02. ^ Dwyer, Jim; Fessenden, Ford (September 11, 2002). "One Hotel's Fight to the Finish; At the Marriott, a Portal to Safety as the Towers Fell". The New York Times. This page was last edited on 28 November 2018, at 00:52 (UTC).